Thanks to Dr. Oana Rafael, Lenox Hill Hospital, New York (USA) for contributing this case. To contribute a Case of the Week, follow the guidelines on our Case of the Week page. 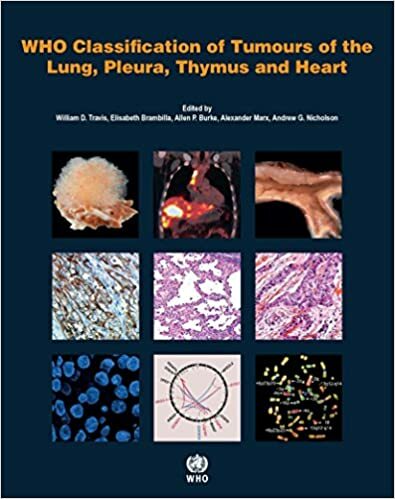 WHO Classification of Tumours of the Lung, Pleura, Thymus and Heart (2015) edited by William D. Travis, Elizabeth Brambilla, Allen P. Burke, Alexander Marx, Andrew G. Nicholson, 410 pages, $112 list. 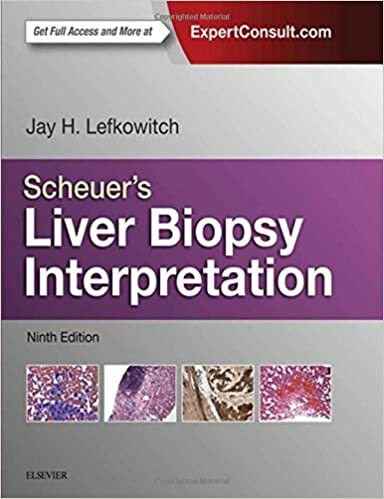 Scheuer's Liver Biopsy Interpretation (2015) by Jay H. Lefkowitch, 440 pages, $106 list. For more popular books, visit our Top Books page. (1) We have recently added Julie E. Kunkel, M.D. to our Membership page. Thank you, Dr. Kunkel, for supporting PathologyOutlines.com! Visit our Individual Membership page to see why you should become a member too! (2) To promote shopping at Amazon.com, we will award Amazon gift cards of $100, $50 and $25 through a drawing of those who made any purchase (it need not be pathology related) at Amazon.com in October and November 2015. To be eligible, you need not purchase through a PathologyOutlines.com link, but we will award one additional $25 gift card for every 50 items purchased over our goal of 400 items purchased through our website. Remember, your purchase supports our free online textbook (through an Amazon commission to us of 5% or more), if you access Amazon.com through a link from PathologyOutlines.com, at no cost to you! To find out how to enter, click here. (3) Many Pathologists were asking us for 2016 Conference dates at CAP. We encourage you to post your 2016 conferences early for these reasons: It is one price for the ad no matter how long it runs. You can post a "save the date" ad now for 2016 and then update it later. Pathologists are planning their time off for 2016 and many need to know the 2016 conference dates now. Posting your conference ad early avoids conflicting dates with other conferences that Pathologists may want to attend. (4) In order to mainstream the job search process, we have decided to move the Job-other ads (Pathology Assistants, Cytotechnologists, Flow Cytometry technicians, etc.) to the main Pathologist Jobs page, starting January 1st. Read more. (5) On October 8th we posted our 5,000th ad! It was from USCF for a Faculty position in Biomedical Science. Looking back to January 2003, we note that our 1st ad was posted by Korn Ferry International. Besides being a valuable tool in the hunt for Jobs, Fellowships, Conferences, Products and Services, these ads are the reason that our site is a free, no registration website. Thanks to ALL our advertisers for your continued support. (6) On October 5th we set another record - daily total visits of 46,454! This may partially be due to us exhibiting at the CAP meeting. If you are thinking about advertising your pathology product or service with us, now is the time! Please email pathoutads@gmail.com or call us at (248) 646-0325 for more information on how to reach the thousands of visitors to our site. (7) Visit our Blog and Subscribe to our Posts or Follow by Email (click on the box on the right side) to see recent updates to the website. An HIV seronegative, 96 year old African-American woman with no remarkable past medical history presented with a left upper eyelid lesion, which was completely excised. The specimen consisted of skin and mucosa-covered soft tissue. 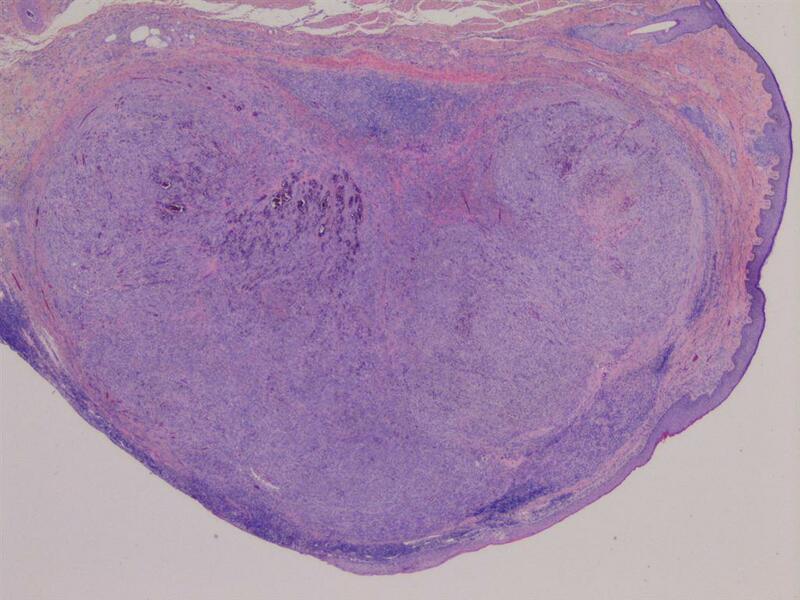 Immediately subjacent to the hairy edge was a 0.7 x 0.5 x 0.5 cm indurated nodule, with a mottled brown tan cut surface. 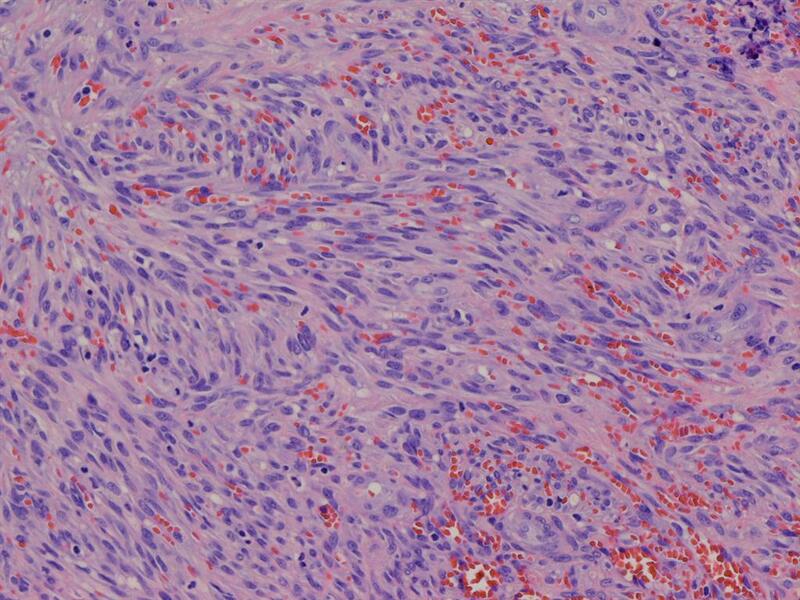 Histological assessment showed a circumscribed stromal tumor (figure 1) with the typical morphology of Kaposi sarcoma, with spindle cells forming vascular spaces, extravasated red blood cells and occasional hyaline globules (figures 2-4). 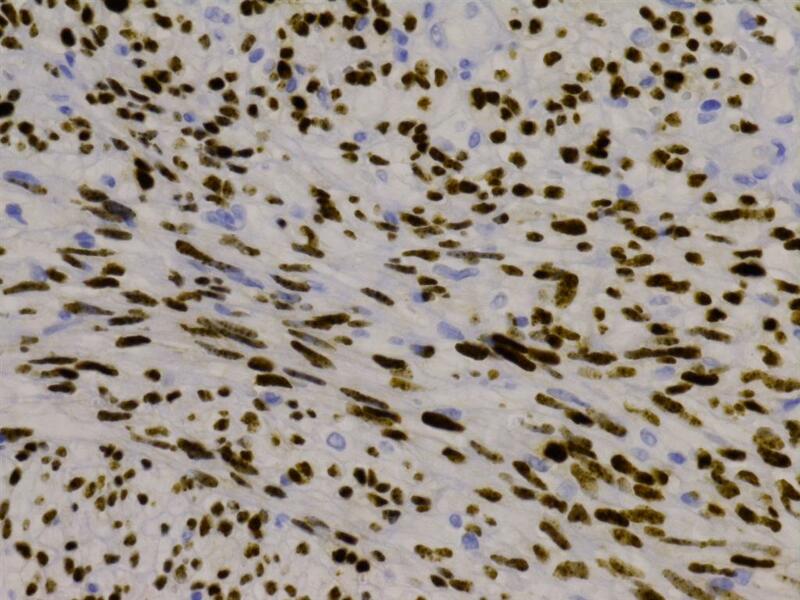 Immunohistochemical studies showed strong reactivity with the vascular differentiation markers CD31 and CD34, as well as with HHV8, the latter of which is uniquely associated with Kaposi sarcoma (in contrast to other vascular sarcomas). Ki-67 revealed 40-50% reactivity. Kaposi sarcoma (KS) was first described in 1872 as an uncommon tumor that principally affected the skin of the lower extremities of elderly patients. There are now four clinical forms recognized: classic (statistically and significantly associated with a second malignant tumor or altered immune state), endemic (African), iatrogenic (transplantation associated) and AIDS related. Despite apparent differences, epidemiologic data strongly pointed to an infectious etiology for all. Human herpesvirus 8 (HHV8) is now considered the causative agent for all forms of Kaposi sarcoma. 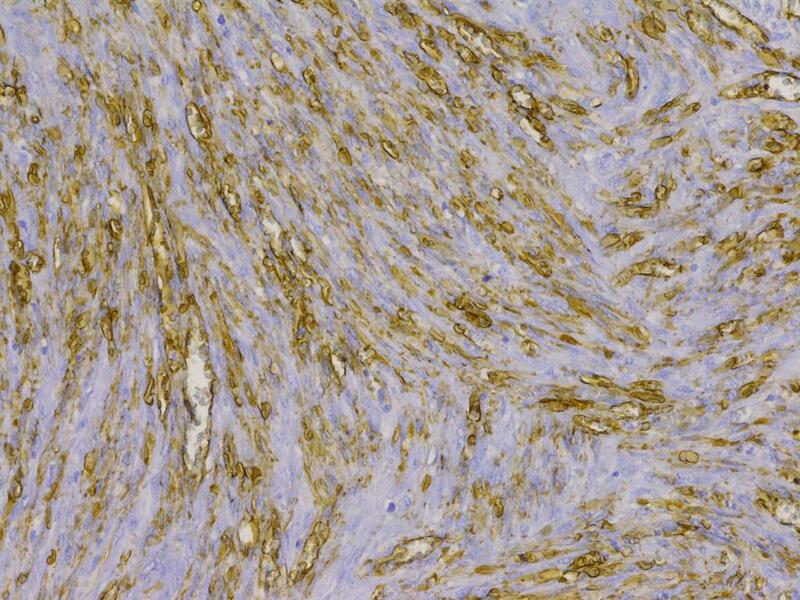 KS is generally considered to be a multicentric (rather than metastatic) and reactive hyperplasia rather than a true sarcoma, though this has been a subject of debate (J Am Acad Dermatol 2008 Aug;59:179). Ophthalmic involvement by KS is rare, and is usually AIDS associated. Eyelid involvement accounts for roughly 15% of ocular manifestations of Kaposi sarcoma (Eyelid Tumors: Clinical Evaluation and Reconstruction Techniques, 2014). Clinically, ophthalmic KS present as purplish red to bright red patches, plaques or papules on the eyelid or conjunctiva. The clinical differential includes basal cell carcinoma, blepharitis, hemagioma and subconjunctival hemorrhage, among others (Eyelid Tumors: Clinical Evaluation and Reconstruction Techniques, 2014). 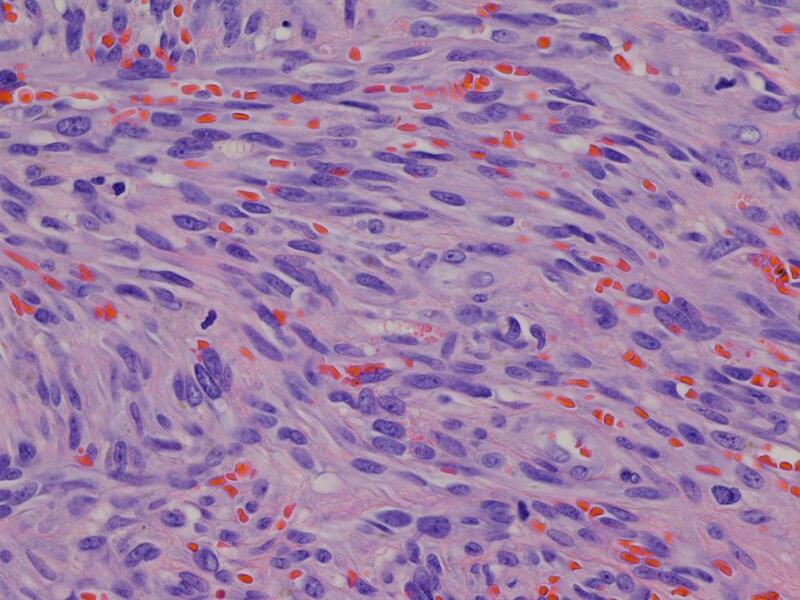 Histopathology shows spindle cells forming slit-like vascular spaces, extravasated red blood cells and occasional PAS positive hyaline globules, which may be extracellular or intracellular. Mitotic activity and pleomorphism are usually minimal. The spindle cell population expresses CD31, CD34 and Ulex Europaeus (Am J Ophthalmol 1980;89:546). The so-called "promontory sign", a feature that is not specific to KS, refers to the proliferation of irregular, jagged vascular channels which partly surrounds a pre-existing vessel, resembling a promontory. In this case, the morphologic and immunophenotypic features were classic. Ki-67 revealed 40-50% reactivity. 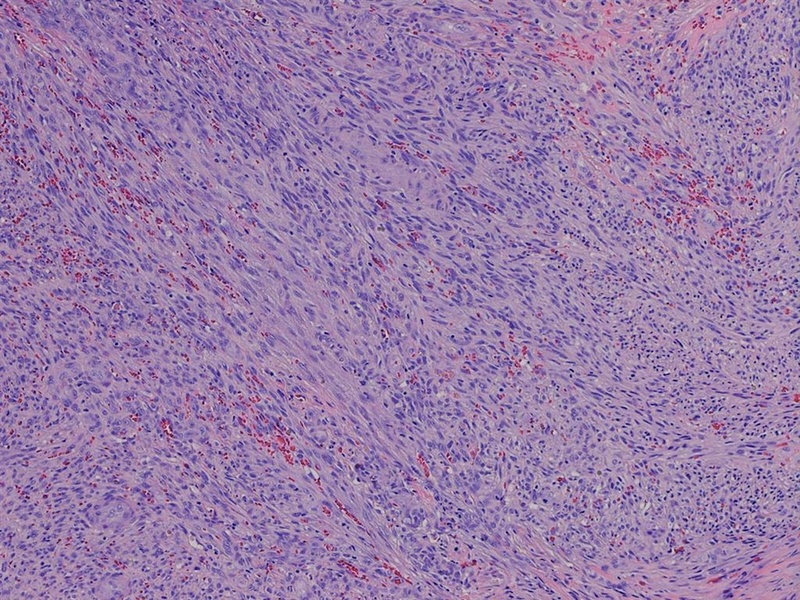 The tumor expressed HHV8, which is uniquely associated with Kaposi sarcoma (in contrast to other vascular sarcomas). 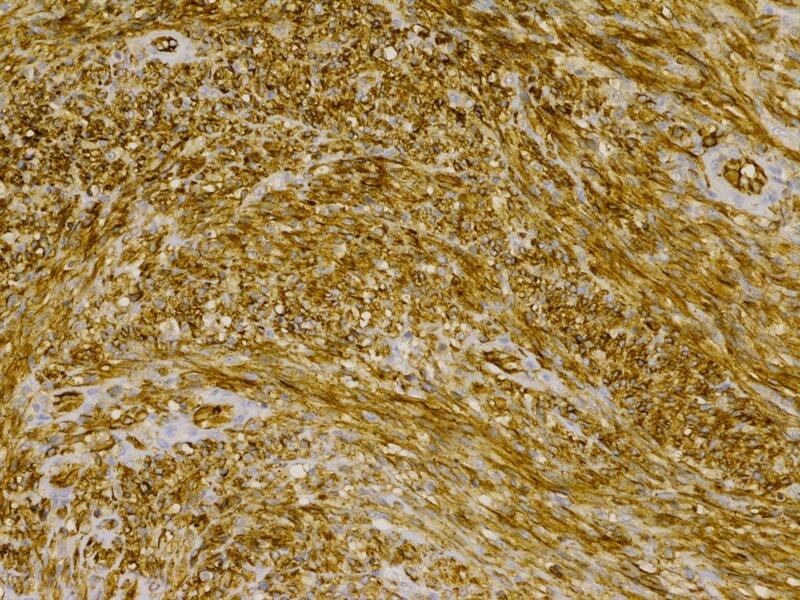 The resection margins were tumor negative. The histologic differential diagnosis is broad and includes other vascular lesions such as microvenular hemangioma, tufted angioma, targetoid hemosiderotic (hobnail) hemangioma, cavernous hemangioma and pyogenic granuloma (McKee's Pathology of the Skin, 2011). Bacillary angiomatosos may resemble nodular KS, as may some fibrohistiocytic tumors such as variants of fibrous histiocytoma and dermal fasciitis. 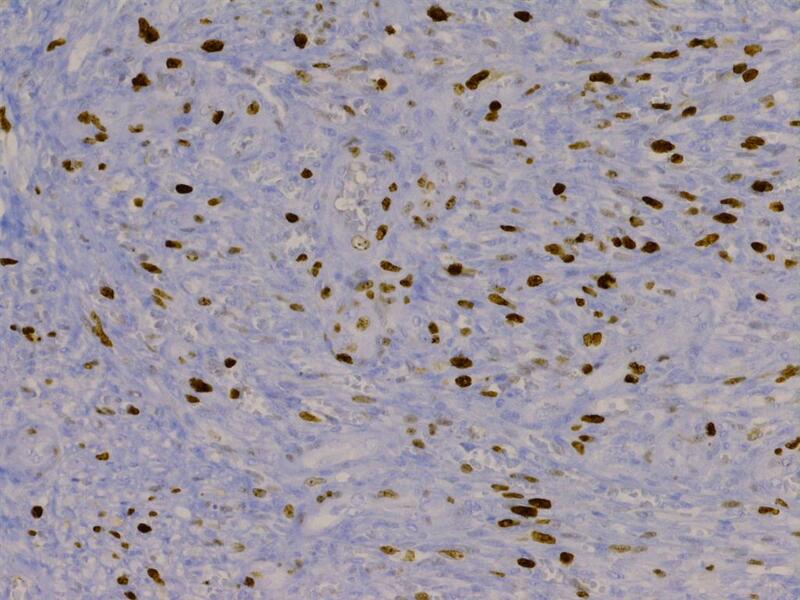 When considering KS as a possibility, positive HHV8 IHC will confirm this diagnosis. KS has a variable course. Some patients develop only a few minor skin lesions while others have much more extensive external and internal disease. The latter lesions may result in fatal complications, e.g., from bleeding, obstruction or perforation of an organ (J Am Acad Dermatol 2008;59:179). One study of 20 patients with ophthalmic, AIDS-related Kaposi sarcoma found that most lesions were slowly progressive and responded to systemic drug therapy. For local treatment of ophthalmic Kaposi sarcoma, irradiation appears to be safe and effective for palliative therapy (Arch Ophthalmol 1989;107:858).